Bellevalia sp. Dja'de 178. This taxon is common on many PPNA sites. 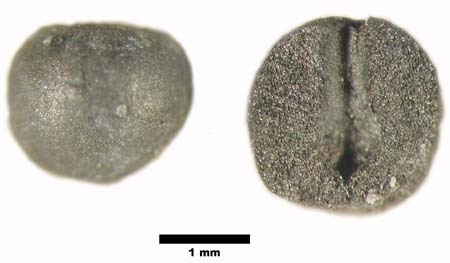 Note radial cell structure in the sectioned seed to the right and smooth surface, left. It may have been be an arable weed. Van Zeist & Bakker-Heeres, 1985, Palaeohistoria, 24, fig. 24.